June the 16th of 1928 barrier speedway started at the Jubilee Oval in Broken Hill, It is believed that they ran about eleven meetings that year. 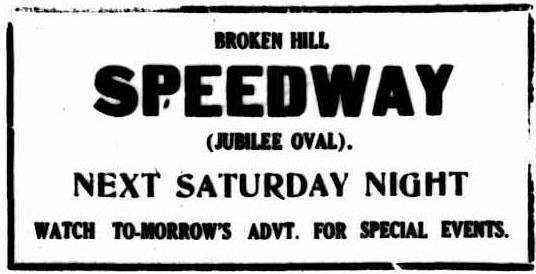 In 1937 the Jubilee Oval once again became a speedway track when a meeting organised featured Midget Speedcar racing. 1946 - was the year that motorcycle speedway racing returned to the Jubilee Oval venue.